Sarojini Naidu Rural Welfare and Education Trust (SNT) is among the small bracket NGOs serving society to the best of its ability. SNT cares for the abandoned senior citizens based in the Dindigul district of Tamil Nadu. SNT has a shelter home which accommodates 20 inmates. SNT not only provides shelter, but trains them during their stay to earn a meaningful amount of money for themselves. Through its community outreach programmes, SNT also empowers rural women by equipping them with financially rewarding skills like tailoring, making soap powder, forming SHGs etc. Regular camps are organized to update the community on current affairs, particularly social issues like human rights, women rights, legal aid and free medical check-up. SNT’s work is recognized by the government and has often supported them with their regular programmes as well as new initiatives. Total Income: SNT’s total income for FY13 declined by 62% from the previous year. Total income for FY13 was Rs0.19mn v/s Rs0.58mn in FY12. During FY13, SNT received donations from local individual donors and the government, each contributing 54% and 45% to total income respectively. The reason for decline in income is due to the subustantial drop in donations (-77%) received from individual donors. This source of funding has been quite volatile for SNT. Programme Expenses: During FY13, SNT spent Rs0.18mn (i.e. 94% of total expenses) towards programme activities conducted throughout the year. SNT’s main focus area is caring for the elderly, and therefore, the programme expenses incurred were concentrated towards providing basic needs to abondoned senior citizens locally. Other than these, SNT also offered vocational training on tailoring to rural women, computer training to adults from marginalised families. It must be noted, that local residents come forward to volunteer and offer their time to train people in different vocations. They often render their services free of cost resulting in low salary bills, thus reducing the programme cost. Overheads: Only 6% of total expenses (i.e. Rs11,238) was spent to meet SNT’s overhead expenses, which was in line with the previous years spent of 6%. SNT’s low overhead cost, suggests that the organisation is optimally utilizing the funds they receive, despite the scale of its total income. General Funds: General Funds stood at Rs95,324 at the end of FY13 v/s Rs0.26mn in FY12. The reason for this negative variation is owing to the declining trend observed in total income in last three years and deficit reported in FY12. 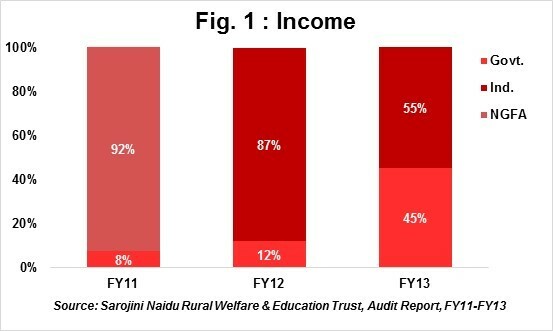 Self Sufficiency Ratio: SNT’s self sufficiency ratio dropped from 78.8% in FY12 to 54.2% in FY13. The ratio indictes an organsation’s ability to meet its expenses from its own funds. Own funds include: donations from individual donors, income generated through sales, service charges and interest income. It is the negative growth in income in FY13 which adversely affected the Self Sufficiency Ratio in FY13. Income Growth Rate: The income growth rate has not been impressive in past three years for SNT. The 3-Year CAGR for the period FY11-FY13 was (-45%). Income from all sources has declined consecutively, suggesting uncertainty in coming years. The growth rate can be improved only if SNT buckles up and reaches out to the right mix of donors immediately. Lack of Funds: SNT is grappling with the issue of raising funds from all categories of donors. The organisation receives adhoc funding from different sources. Such sporadic form of funding can be a matter of concern as it might affect the longevity of the organisation, if not addressed soon. Lack of Resources: SNT currently has limited staff who are not conversant with technology, nor marketing techniques. SNT’s tight financial position doesn’t allow the organisation to recruit professionals to raise funds and maintain donor contacts. SNT is seeking support from volunteers to come forward and support them to build a sustainable organisation. SNT has seven trustees on its Board who meets thrice in a year. Out of the seven, three are actively involved in the day to day operations of the trust. The key personnel (three trustees), officially meet once every month to review the performance and roll out plan of the next month. The minutes of the meeting are recorded at the Centre, both in physical as well as in electronic form given its location in a remote area. SNT has chosen not to list with accrediting and fund raising agencies.